Pictured Above: Chapter President Ellington Sweeney (left), Alice Kane (middle). Ironhide781 (right). Many thanks to Alice Kane, the featured speaker at our November chapter meeting. Alice gave a fabulous talk titled “Research at the Boston Public Library: Navigating the Landscape,” which was loaded with photos and great advice for making a trip to the Boston Public Library! We are currently booking speakers for the 2017 calendar year. Members: if you are working on a new presentation and would like to give it a test run, we would be happy to have you speak at one of our upcoming meetings! Also, we are in the final stretch of our 2016 chapter project: indexing for FamilySearch. Please visit FamilySearch Indexing for more information about how to get involved. Prizes will be awarded in December, but there is still time to participate. To help get you motivated, we are in the process of organizing an “Index-A-Thon” to be held the weekend of November 26-27. Details coming soon. Next month: Dee Dee and Sherlock Aedipo will be hosting our annual Holiday Party. Stay tuned for more details! Special thanks to Clarise Beaumont for the continued use of Just Genealogy for our meetings. The fall colors and pumpkins were lovely! 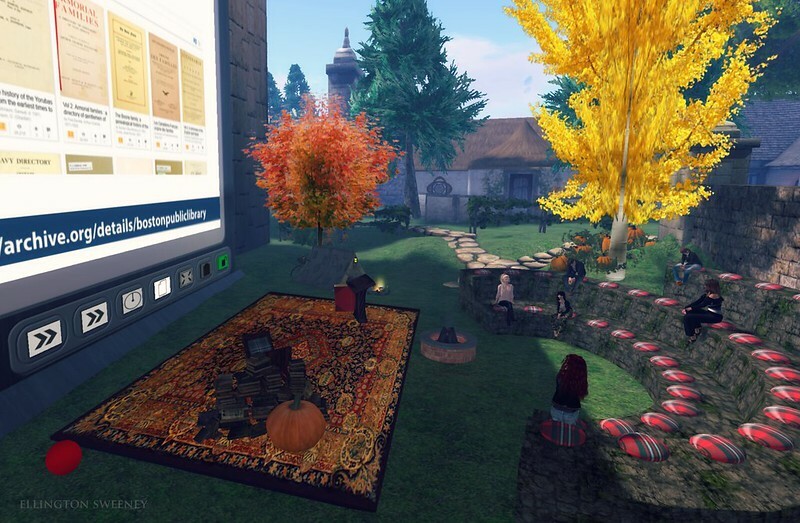 This entry was posted in Meetings and tagged alice kane, apg, boston public library, familysearch indexing, just genealogy, second life, second life chapter, sl-apg on November 14, 2016 by Ellington Sweeney.